ENGLEWOOD, Colo. -- For the second straight year, there is little consensus about the quarterbacks in the NFL draft class. And when there is no consensus on the quarterbacks, it makes selection weekend a little more unpredictable. After watching a pile of game video and spending plenty of cellphone minutes with coaches and scouts, here's one man's top 100 for the 2017 NFL draft. It isn't a mock draft, just the top 100 players ranked, regardless of position. While the quarterbacks will certainly be selected well before the spots I have them slotted, it doesn't mean that's where teams ranked them. And as always, if you disagree with the rankings, rest assured, many in the league whom I have long respected have already objected. I left two players off this top 100 board -- Oklahoma running back Joe Mixon and Michigan cornerback Jourdan Lewis -- even though many teams believe they will be selected in the first few rounds. Mixon punched a woman in the face during an altercation in July 2014. Lewis was charged with one count of misdemeanor domestic violence in March. Lewis has a trial date in July, when additional information will be revealed that might show I've made a mistake. But every talent evaluator in the league has to make a choice when evaluating these players, as well as others with injuries or off-the-field questions. Note: Best verified or electronically timed 40-yard dash time in parentheses. In another year without a clear-cut favorite at quarterback at the top of the board, Garrett is an elite athlete who has produced at a high level in the Southeastern Conference. He also happens to play a high-demand position. That's the profile of the No. 1 pick. Several teams had him in the 4.3s in his 40-yard dash at his pro day. And this, my friends, is a ballplayer simply waiting for the team smart enough to call his name. He's physical, smart, athletic and a future team captain. Oh, and early in his career at LSU he was the best special-teams player on the field. There have been plenty of years when a player like Allen would be at the top of the board. And there are plenty in the league who think he should be there this year after winning the Nagurski, Bednarik and Hendricks Awards. His 28.5 career sacks are second in Tide history, behind only Pro Football Hall of Famer Derrick Thomas. The Pac-12's Defensive Player of the Year presents a question about where to play him up front, but he's explosive and a high-motor player. He's consistently difficult to block, no matter where he lines up. He has missed a lot of time with hamstring injuries -- almost two full seasons -- which gives you pause. But when healthy, his skills are undeniable, especially when you watch him come out of his backpedal to easily run with the fastest receivers. See how he performed on the biggest stage, with top-shelf efforts in back-to-back national championship games, including 106 yards receiving in January and 208 yards receiving the previous year. He has the look of a matchup problem for defenses. The young receivers who transition the best into the NFL are the ones who play well through contact and can win contested catches. Williams is a quality route runner who has the frame and the desire to win the ball. His touchdown run off a lateral in his final game is one of my favorite plays of the season. He's the best lineman in this draft, and while some believe he's looking at a move inside to guard, he deserves a look at tackle. A look at his work against Alabama is all the proof you need. He dishes out plenty of punishment as a runner but takes plenty as well, and that can be a problem as a pro. There are some concerns about his ankles, but he is big and fast and can simply lug the rock. He averaged 6.2 yards per carry in three seasons in the SEC. He's not close to being a finished product, with just one season as an unquestioned starter in the Buckeyes' defense. He misses some tackles and is coming off shoulder surgery, but he finds the ball quickly and gets to the right spots, with seven interceptions last season. He had three seasons of at least 1,408 yards receiving and three seasons with at least 12 touchdowns. He had 1,500 yards and 19 touchdowns last season and was named the MAC's Offensive Player of the Year. The conference's defensive backs will celebrate his move to the NFL. He is the Vols' all-time sack leader, and any guy who breaks a mark held by Reggie White deserves a long look. Barnett was ill at the scouting combine and had a strained hamstring at the school's pro day, so scouts didn't see his best in workouts. But he's a highly productive player who knows better than most in the college game how to win the hand-fighting along the line of scrimmage. He was a walk-on at Temple, but he's a top-tier athlete heading into the NFL. He won't overpower blockers, but he had 22.5 tackles for loss last season. He's the kind of player an NFL defensive coordinator will enjoy figuring out where to put. Teams are projecting with him, since he had just 21 receptions in 2015 and 43 last season, but he looks like an NFL playmaker. He cleared 7 feet as a prep high jumper and understands what he needs to do in his routes. He drops some passes, but there's plenty to work with here. He played just one year of power-conference football after transferring from Wisconsin-Stevens Point and had hip surgery after the Badgers' bowl game. But Wisconsin trains its linemen well, and the offense gives NFL talent evaluators a better look at future pro prospects than spread offenses played elsewhere. He started every game the past two seasons for the traditionally talent-laden Buckeyes. Conley is also far more adept at press coverage than many of his peers in the college game, always a popular trait on the draft's opening night, especially for a 6-foot corner with his kind of speed. He worked with the linebackers at the scouting combine, which tells you that even decision-makers in the league have yet to decide where to play him. He had just one interception in his career with the Wolverines but is a multitask athlete who can be a returner. McCaffrey's workouts, including what he showed as a receiver at his pro day, have helped him shove aside questions about sitting out Stanford's bowl game. While he sees himself as an every-down back, those in the league who like him best see him as a change-of-pace back who can also line up at receiver and be a primary returner. Foster finished last season with 115 tackles and is a classic run-and-hit linebacker with coverage skills. If there is a concern, it's his medical history: He has had shoulder surgery, and according to some teams he suffered multiple "stingers" in college. He also got sent home from the combine for his behavior at the hospital during a medical exam. He has overcome a lot in his life to be an elite edge-rushing prospect with a bright NFL future. He had 10 sacks last season with plenty of attention from opposing offenses, and he gets off blocks better than most in a draft class loaded with pass-rushers. Bolles says he overcame his own behavior as a youngster, which could have prevented him from reaching this moment. His footwork, athleticism and game-day edge could help him to be taken before this slot even with just one season of major college football. Some guys tested better, had better stats and showed more consistency than Charlton. But watch his game video and you'll see two of the most important traits for an NFL rusher: the flexibility to bend and the ability to make the change from speed to power at the right moment. White has played outside and in the slot for the Tigers, so NFL talent evaluators have gotten a good look at what he can do. Some question how well he'll be able to tackle in the NFL, but his coverage skills outweigh those concerns. Humphrey has all the physical attributes, plays with toughness, and is able to recover from mistakes. He can be challenged deep, however, and he needs to work on that. It would be a mistake to say Ross put himself on the radar by setting a combine record in the 40-yard dash. He was already a highly productive receiver with pro potential and only confirmed his elite speed in Indianapolis (even after ACL surgery in 2015 and a torn meniscus in 2014). He will step in as a downfield playmaker and returner. He has work to do on his overall game but should provide impact in the pass rush out of the gate. His game video reveals refined moves and, more importantly for an NFL prospect, refined countermoves when his first move doesn't work. Teams have been forced to look back at the 2014 and '15 seasons because he had just 1.5 sacks last year playing with an ankle injury. Some scouts have questioned his effort, not uncommon for a player this gifted without even a five-sack season on the interior, but the potential is clear. Quarterbacks will be selected long before this slot, but Watson's performance on the biggest stage makes him the best of this year's prospects. He rebounds from mistakes, elevates his play in important moments, and plays with toughness. Many defenders who have faced him, including Alabama's Jonathan Allen, say they marveled at how Watson plays with the pressure on. Davis was productive on special teams before he became a defensive starter -- that's the start of an NFL résumé. He's a quality tackler who rarely takes false steps after the snap. He has been lauded for his leadership and work ethic. He's the tallest of the top-tier cornerback prospects on the board, so some might see him as a hybrid cornerback/free safety. There are some bobbles in his technique, but the bottom line is that he rarely surrenders touchdowns and plays the ball in the air better than many receivers. He plays with the confidence of a pro, doesn't shy away from challenges, and rebounds from mistakes. That's a pro corner in waiting. He is an enthusiastic tackler who started 22 games over the past two seasons with the Gators. Baker was a state high school sprint champ before he came to the Huskies, and his coverage skills make him a popular prospect. Teams see him in a deep safety role. He was a quality tackler in college, but some teams have concerns about how he would do if he had to play in run support often. Cook will almost certainly be selected before this slot and is among the best in a loaded running back class. He rushed for 1,765 yards last season, but hamstring issues, shoulder surgery and several off-the-field incidents might give teams worthy pause. Brantley mirrors many prospects at high-end programs: He is gifted but was a rotation player (high of six tackles in a game) on a loaded defense with plenty of prized recruits. But he has the look of an NFL defensive tackle and was productive with his snaps, totaling 8.5 tackles for loss and 2.5 sacks in 2016. A versatile player, he was tied for second on the team with 40 receptions in 2016 and was a productive runner despite never reaching 21 carries in any game at Tennessee. He had some early off-the-field issues during his time at Alabama, but Vols coaches have vouched for him. Melifonwu is an athletic player and was a four-year starter in college. Some teams see him as a strong safety who could play weakside linebacker in some specialty packages. He played on offense, defense and special teams for the Trojans. Jackson projects as a cornerback who could play some snaps at receiver. He can get his hands on the football on defense, was a two-time Pac-12 long jump champion, and has run the 100 meters in 10.38 seconds. In a talent-laden conference, Cunningham was the one guy opponents had to contain on the Commodores' defense. And all Cunningham did was make play after play, posting 125 tackles last season, including 16.5 for loss. If a team is looking for a tight end who can block and catch, Engram isn't the guy. But he's a two-time team captain with wide receiver speed, and NFL offenses will find a lot to like about Engram. He made plays via short, intermediate and deep routes, averaging 14.2 yards per catch in 2016. He missed part of his final season because of a fractured bone in his face, which he suffered in a fight with a teammate. Although he is considered a high-end pass-rush prospect with plenty of upside, he never had more than nine sacks in a season. He also played two seasons with the Cougars basketball team. Opinions are split on Robinson as a prospect, especially in terms of his footwork against the best speed rushers he has faced. A three-year starter, he will probably be selected long before this spot since it's a thin year for tackles, a position for which there is great demand. He will almost certainly be a first-round pick, and many teams believe he will go in the upper third of the opening round. He has big-time potential but started only one season for the Tar Heels and will need more time to develop than he's likely to be afforded. He doesn't always feel the rush, and that will lead to mistakes in the NFL. He has had injuries (back, hand) but has shown polish in his routes. He battles for the ball and wins in traffic. He's also a high-character player. He returned some kicks early in his career with the Trojans, so he could get a look there. Watt, the younger brother of Texans All-Pro J.J. Watt, has suffered injuries to both of his knees in his career. But T.J. showed what he can do last season with 11.5 sacks. He's a quality run defender, and many scouts believe he'll get a little bigger as a pro and maintain his athleticism. His father, Robert, earned three Super Bowl rings with the Dallas Cowboys. Zay had an astounding 399 catches in his career, including a record 158 receptions last season. He was also a kick returner early in his career. He will have to show he can beat man coverage as a pro, something he rarely saw in college. He played just one season of prep football. There's no reason to believe he won't have an impact quickly in the NFL given his athleticism, but the game video shows his routes need work. He had 49 catches in 2016, and he'll run by plenty of defenders in the NFL. Teams that have met with Anderson in the pre-draft process have consistently said he has a tremendous feel for the game and a great understanding of his assignments -- the "why'' component. He is a low-risk pick who had 19 tackles for loss and nine sacks in 2016. He was the Big 12 Defensive Player of the Year last season and led the conference with 11.5 sacks. He is a no-frills pass-rusher who knows how to get things done. He needs some work on countermoves, but his athleticism is eye-catching, and he's a sure tackler. He suffered a lacerated kidney early in his career with the Buffaloes but went on to post 90 tackles in 2015 and 65 tackles this past season. Awuzie can line up outside or in the slot in man coverage, and he has elite speed. He's also a quality special-teams player. Another big safety with speed in a deep class of defensive backs, Jones led the team in tackles last season with 109. And for teams that play in specialty packages a lot on defense -- almost everybody these days -- Jones could play in the box on some downs. He's one of the biggest hitters on the board. Maye suffered a fractured arm on senior day and missed the final four games. He has surrendered some scoring plays along the way but is another NFL-ready player with the size-speed combination defensive coaches want in the formation. For some observers, Mahomes' power arm has him at the top of the QB list. He threw 77 touchdown passes the past two seasons combined, but his accuracy wavers when he can't match his delivery to the throw required. An impatient team will impede his development. As with Watson, Mahomes and Trubisky, Kizer has ardent supporters who think he might emerge as the best pro quarterback in the class. He seemed to be pressing in the Irish offense and threw plenty of interceptions because of it -- at least one in 65 percent of his starts, and 19 in his career. He started every game of his career, 46 in all, and presents a rare combination of athleticism and production. He has dominated his competition but will have to consistently get off blocks against bigger players in the league. He rushed for 771 yards this past season, at 8 yards per carry, to go with 74 receptions for 865 yards. He totaled 15 touchdowns. He projects as a wide receiver who could offer options in the run game for creative coordinators. He has too much speed to ignore but has developmental work to do. A three-year starter at Michigan with tons of athleticism, Wormley will be a popular name on the second day of the draft. He can play inside or outside, and the coaches who get him to turn up the throttle will get a consistent playmaker. He played college basketball at Pittsburgh-Johnstown before starting his football career at Division II Ashland. Shaheen might be the best receiver/blocker combination at tight end in the draft, and his size makes him a potential matchup problem. He had 16 TDs in 2016. He played right guard most of the time for the Hoosiers, though he did perform well at right tackle when he played there because of injuries to other players. He needs more strength, but he started four seasons and is a two-time team captain who plays with awareness and toughness. Williams will probably get drafted before this slot, but his off-the-field résumé, including an arrest on a misdemeanor gun charge and a reported failed drug test, is cause for concern. An explosive athlete, he is likely to play only on pass-rush downs early in his career. Williams started as a true freshman for the Utes in 2014. He plays the ball well and closes the deal when he gets his hands on it -- five interceptions in both 2015 and '16. He's a smart player who excelled academically. Though he nudged his way above 300 pounds at the scouting combine, most talent evaluators say he checked in anywhere between 280 to 290 pounds for most of his college career. He'll need to get stronger, but he's a big-framed player who moves well, and he dominated in pass protection. A four-year starter, 52 games in all, Moton played three seasons at right tackle, including in 2016, and a season at right guard. Most say he will be a guard in the NFL, and more than one scout has cited his work against Ohio State in 2015, when Moton played guard. He transferred from Tennessee after playing 11 games in two seasons and went on to be a two-year starter for the Panthers. Peterman played in a pro-style offense and is better at progressions than most of his peers. He looks defenders off and throws with accuracy. It tells you how deep the draft is at defensive back when a player with Tankersley's size and speed is considered a second-day player by most teams. He has the production, including nine interceptions in the past two seasons combined, and excels in man coverage more than in zone. He lined up at tackle for the Owls, and while he shows some skill as a future right tackle, his first NFL look should come as a guard. He plays with power and has shown he can play in both a zone-run scheme and a man-on-man blocking scheme. You don't hear his name mentioned among the top wideouts in this draft, but against USC in his final college game, Godwin had 187 yards receiving and two touchdowns. He had a 1,000-yard season as junior, topped 900 yards last season and played in 40 games in his career. He's a projection because he had just one year when he consistently looked like a draftable player -- his senior season, when he led the team with 93 tackles. He works hard, has athleticism and figures to keep working to be a productive pro. He plays with the physical edge that defensive coaches like and has plenty of highlight tackles. He had 78 tackles as a junior and 87 as a senior. He gets out of position at times, but he also plays with athleticism and passion. He carries some medical questions, having missed time in two seasons because of shoulder troubles and a fractured arm last season. His athleticism is better than this slot, but his injuries might drop him lower. He closed out his career with the Buckeyes with back-to-back 100-tackle seasons on a defense loaded with NFL prospects. He's a no-frills player who just does what needs to get done on defense. A former running back, Moreau is a rare athlete at cornerback. He carries some injury concerns; he has had a Lisfranc injury with the Bruins and suffered a torn chest muscle on his pro day. He has also drawn flags because he's prone to grabbing receivers when he gets in trouble. He's a big-framed left tackle in a draft that is short on those kinds of players. He's far better in the run game than in pass protection, which could make him a right tackle initially. He has gotten by with his reach and awareness, and his footwork needs plenty of attention. He won the Jim Thorpe Award as a junior and still went back and played his senior season for the Hawkeyes. The game video shows he was rarely challenged last season in the passing game. He was a four-year starter who can also return kickoffs and punts. He was the Mid-America Conference Defensive Player of the Year with 11.5 sacks last season. He's not a springy, flexible athlete like others at the position on this draft board. But he plays fast and has the reach and ability to separate from blockers, which defensive coaches love to see. He finished his career with 428 catches, 6,464 receiving yards and 73 touchdown catches. He had three 100-catch seasons to go with 93 catch as a freshman. Kupp snatches the ball and runs quality routes, and he consistently won the ball against the best cornerbacks he faced. Teams have to decide which of his seasons is more indicative of the pro he will be: his productive senior season, when he consistently split double-teams and played with power, or the lackluster junior season that came before it. Rivers had 14 sacks as a sophomore and 14 as a senior in 2016. He will have a transition to the NFL as teams figure out where to play him. But he is a high-effort player with edge-rush skills. A native of London, Eluemunor is a former rugby player who started games at both right guard and right tackle last season for the Aggies. He's still early in his football career, but the team that's willing to put in the work could find a starter. He played behind Baker Mayfield and Patrick Mahomes II in his time at Texas Tech before being a one-year starter at Cal. Webb topped 4,000 yards to go with 37 touchdowns in 2016 but has plenty of work ahead to transition to a pro offense. A former wrestler, he has the pro profile as a three-time first-team All-Big Ten center and team captain. Scouts love former wrestlers at the position because of their balance and ability to win battles in tight spaces. He might be the biggest riddle on the draft board. Tabor was an All-SEC player with the Gators but ran a dismal 4.62 40-yard dash at the combine and followed with an even worse 4.7 at his pro day. He can cover and has said people shouldn't be worried about his speed, but they still are. He was a rotational player at Alabama who might actually play a higher percentage of a defense's snaps as a pro. He stuffs plays in the run game. Aside from football, he's also an artist who could have gone to Harvard, and he has two bachelor's degrees. The doctors will make the call for Jones, who was a first-round pick before he tore his Achilles tendon during his pro day last month. He faces a long recovery, but he has told teams he could be running in four months and playing in six. Opinions about Walker vary among talent evaluators. He had a 4.5-sack game this past season against Mississippi and finished the season with 16 sacks. But he doesn't always show the explosiveness that translates in the pros. He tackles with purpose, however, and on the right team he could develop well. Any guy with a 400-yard rushing game in his career is worthy of attention; Perine had 427 yards in a single game against Kansas as a true freshman. He's a power player whose coaches have lauded his work ethic. He should be durable as an NFL runner but needs work in pass protection. He missed a season with an ACL tear and part of another season with a hip injury, so medical staffs will determine his draft slot. When he's healthy, he has shown quickness, a quality first step and acceleration to the ball. He worked on Tech's scout team as a quarterback and tight end during his redshirt season. He had three seasons with at least 40 receptions. He's still learning the position and lets the ball get into his body at times, which has led to drops, but he has the reach and speed to be a matchup problem. Bama didn't throw the ball nearly as much as most other teams, but with a true freshman at quarterback in Jalen Hurts, Stewart finished with 54 receptions in 2016. He should contribute immediately. At LSU he made 27 starts at center, nine at right guard and one at right tackle. He's tall for a center, but he played with intelligence and awareness as he moved from position to position. He was a team captain. In the right scheme, Johnson should have an impact as an interior pass-rusher. He is a high-effort player who had 13 sacks over the past two seasons on the inside. He led the Hawkeyes in sacks with 7.5 in 2016. Big corners have a tendency to move up the draft board. Many defensive coaches say that Douglas, because he doesn't have elite timed speed, will need to play in a zone-heavy scheme. He plays the ball well and had eight interceptions in 2016. A pro-ready tight end, he's another player who would have been ranked higher before suffering an injury. The doctors' reports will determine his draft spot after he suffered an ACL tear in January. He has said he could be ready by the end of training camp. He elected to return for his senior year and helped the Tigers to a national title. Watkins is a big player with plenty of movement skills. He had 10.5 sacks last season and 3.5 sacks as a junior. After cameos at left tackle and right guard, he played the majority of his career at left guard for the Panthers. He's a smart, tough guy who consistently puts his defender on the ground in the run game. Transferred from Idaho State and finished at Cal with a 92-catch season, despite missing two games with an injury. He will have to transition from Cal's offense, which didn't feature a variety of routes, but he has plenty of upside. Along with his man-to-man coverage skills, he has plenty of potential as a returner, with three punt-return touchdowns in his career. He was a four-year starter for the Vols and had two interceptions as a true freshman. A two-time Mountain West Defensive Player of the Year, Kazee had seven interceptions in 2015 and eight last season. He might not have the timed speed of other cornerbacks in this draft, but he finds the ball and is a willing tackler in the run game. Scouts have seen him play in 4-3 and 3-4 looks, so they can project him in either scheme as a pro. He tore his ACL late in the 2016 season, but he was a highly productive player who should transition to the NFL. Kpassagnon has all the physical attributes teams want, and he recorded plenty of production on the field, including 11 sacks and 21.5 tackles for loss in 2016. As a high achiever in the classroom, he has had to convince teams he's passionate about football. Take a smart, productive player, coach him up and see where it goes. Through the years, No. 100 has been a player I like for whatever reason. He may or may not really be the 100th player on the board, but I put him there because I think he will succeed. Past No. 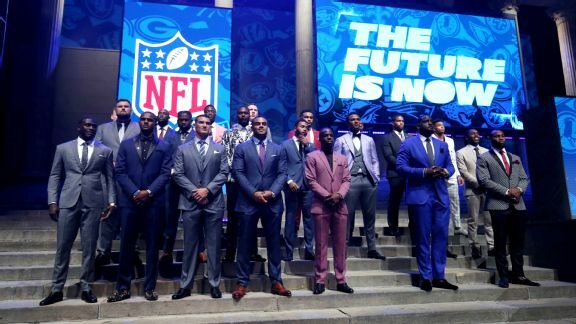 100s have included current Giants wide receiver Brandon Marshall and Detroit Lions defensive tackle Akeem Spence. Dobbs threw too many interceptions downfield last season, but the Vols went 23-12 in his starts and 3-0 in bowls. He has the smarts to have majored in aerospace engineering.